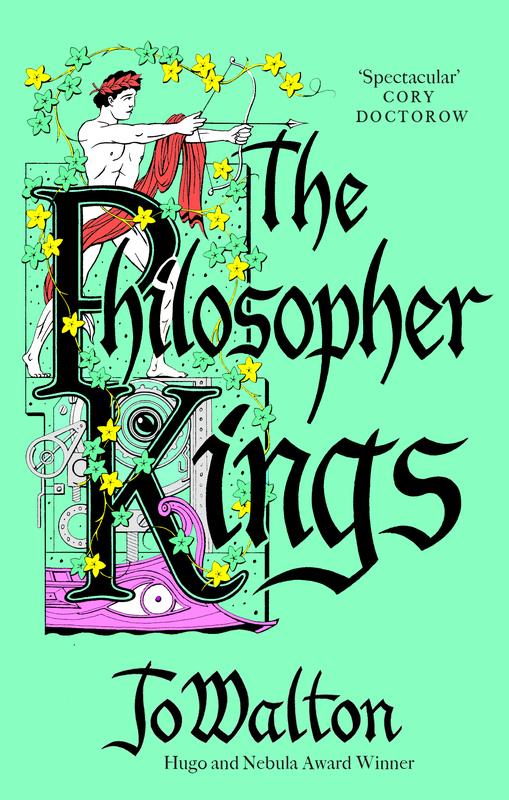 The Philosopher Kings is the sequel to The Just City. Read that first! It was published by Tor in hardcover and e-book on June 30th 2015, and is from Corsair in the UK as an e-book in July 2015, and as a trade paperback in January 2016. It is my twelfth published novel. I wrote it betwen 20th June and 28th November 2013, in 28 writing days, and then revised it in early 2014. It’s set twenty years after the end of The Just City. The Philosopher Kings is about… love and excellence. And responsibility. And art. And it’s about Apollo and his daughter Arete and Ficino and some other people going on a boat trip that leads them to end up somewhere you’d never have expected. The Just City uses the myth of Apollo and Daphne. 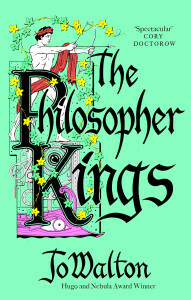 The Philosopher Kings uses the myth of Apollo and Marsyas. Read The Just City first, did I say that already? It seems to work for people reading it without, but it’s full of spoilers for the first book. 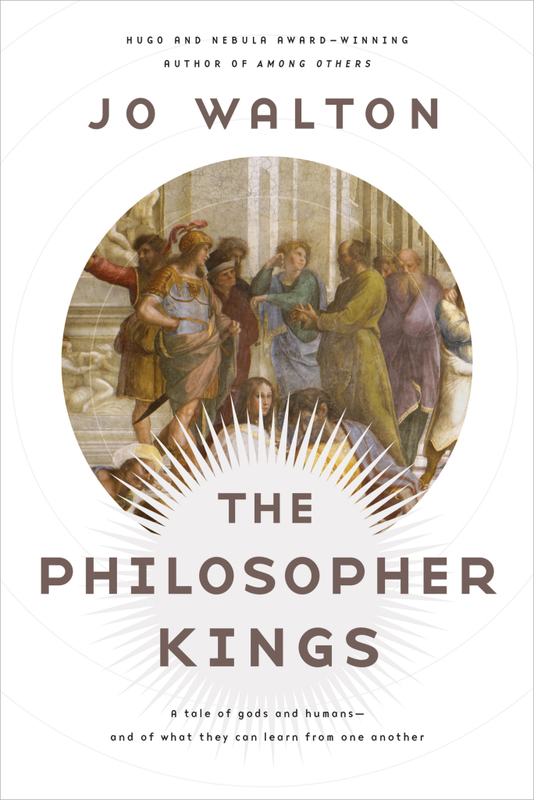 From acclaimed, award-winning author Jo Walton: Philosopher Kings, a tale of gods and humans, and the surprising things they have to learn from one another. Twenty years have elapsed since the events of The Just City. The City, founded by the time-traveling goddess Pallas Athene, organized on the principles espoused in Plato’s Republic and populated by people from all eras of human history, has now split into five cities, and low-level armed conflict between them is not unheard-of. The god Apollo, living (by his own choice) a human life as “Pythias” in the City, his true identity known only to a few, is now married and the father of several children. But a tragic loss causes him to become consumed with the desire for revenge. Being Apollo, he goes handling it in a seemingly rational and systematic way, but it’s evident, particularly to his precocious daughter Arete, that he is unhinged with grief. Along with Arete and several of his sons, plus a boatload of other volunteers–including the now fantastically aged Marsilio Ficino, the great humanist of Renaissance Florence–Pythias/Apollo goes sailing into the mysterious Eastern Mediterranean of pre-antiquity to see what they can find–possibly the man who may have caused his great grief, possibly communities of the earliest people to call themselves “Greek.” What Apollo, his daughter, and the rest of the expedition will discover…will change everything. Events unfold as characters and ideas develop, and one of the reading pleasures of the novels is watching the feedback among characters, ideas, and events, and entering into the dialogues ourselves. The ending is a knock-out, tongue-in-cheek deus ex machina twist explicitly stating that no matter how much The Philosopher Kings departed from The Just City, the third and final book, Necessity, will move exponentially farther away — both literally and figuratively. If there’s one thing Walton is brilliant at — and there are roughly one million of those — it’s not letting you know quite what kind of story you’re in, and leading you to relish the discovery. What hasn’t changed is Walton’s mastery of character and emotion and idea. While The Philosopher Kings lacks the tight focus of its predecessor, it’s just as thrilling. Then, at the end, Walton reveals she’s been thinking on a far grander scale all along. A third book can’t come fast enough. As an SF novel dealing head-on with the sorts of ideas that SF often claims to examine without examining them, it’s just enough of a provocative thought experiment to leave us wondering what on Earth Walton has in mind for the third volume. the end result is a satisfying conclusion, with room for more if desired. the science it deals with is moral science: it’s a science fiction of philosophy, as much argument as adventure, and its nature is such as to invite the reader to participate. That’s half the fun. More than half, over and above Walton’s agreeable prose and solidly believable characters—even Apollo is believable, and I have high standards for fictional gods, though that might be hubris. What does it mean to strive for excellence, as a person, and as a person among other people? What does it mean to be a hero, or a philosopher? 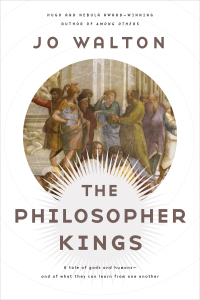 The Philosopher Kings is a very entertaining novel. It’s even more entertaining as an argument. This novel of ideas is at once old-fashioned and cutting-edge. In other words, like Athene, Walton has culled the best from all eras and made a rousing tale therefrom. It is within these layered relationships, between people, and between the ideas that they represent (without their ever being reduced to an idea) that I think we find Walton’s achievement: to leave us in perpetual uneasiness with all the proffered solutions.